Heat oven to 375°F. Spray 12-cup fluted tube cake pan with Crisco® Original No-Stick Cooking Spray. In food processor, place cranberries. Cover; process until coarsely chopped. Add cream cheese and 4 tablespoons of the marmalade; process until well blended. Set aside. 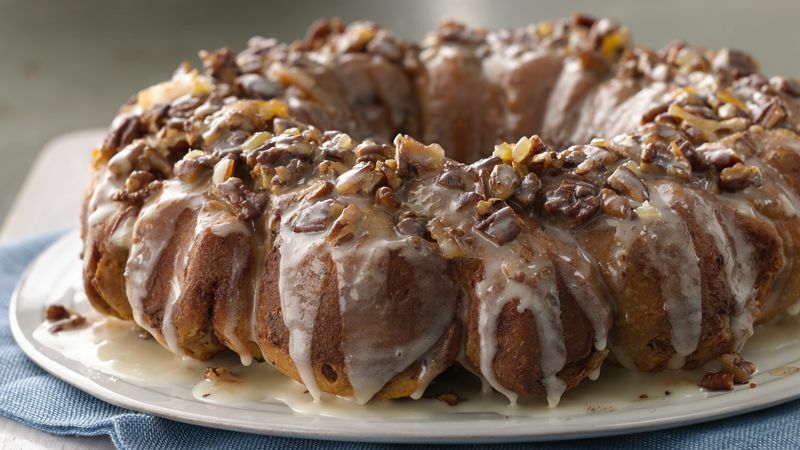 Pour 3 tablespoons of the butter in bottom of cake pan; sprinkle with pecans. Separate dough into 13 rolls; reserve icing. Place rolls on work surface, cinnamon side up. Flatten each roll to 3 1/2-inch round. Spoon about 1 tablespoonful of the cream cheese mixture on center of each round. Fold dough over filling; pinch edges to seal. Repeat with remaining rounds and filling. Dip filled rolls in remaining 3 tablespoons butter. Place rolls in pan, seam side up, overlapping slightly. Drizzle with any remaining butter. Bake 23 to 28 minutes or until golden brown. Cool in pan 2 minutes. Place heatproof serving plate upside down over pan; carefully turn plate and pan over. Remove pan. Cool 5 minutes. In small bowl, mix both cans of icing and remaining 1 tablespoon marmalade until blended; drizzle over cinnamon rolls.